Another review brought over from Suite101. Jason Graham, Stefano Valdo, Gavin Sorochan and Steve Fletcher delivered impressive performances at the BeatNiq on February 4 & 5, 2011. The Calgary Wind Symphony wrapped up its 2012/13 season with sweeping melodies, dramatic harmonies and rich contrasts. This unique piano competition held Saturday, October 15, 2011 in Calgary, Alberta raised over $100,000 for the 2012 Honens International Piano Competition. The final concert in the Calgary Jazz Orchestra's 2012/13 concert season featured two World Premieres, jazzy pop-rock, vivid soundscapes and lots of laughter. Driving, funky jazz versions of video game music were on tap when The Runaway Five performed in concert in Calgary, Alberta at the National Musical Centre Saturday, April 6, 2013. It was the jazz group's first "all ages" show. 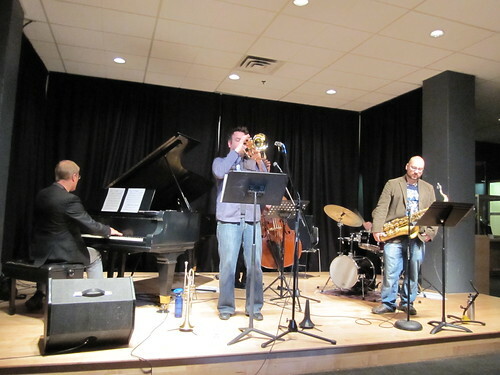 This concert featured Johnny Summers on trumpet and flugelhorn, Shane Statz on tenor sax, Sheldon Zandboer on piano, Brendan McElroy on bass and Karl Schwonik on drums. It was the group's first performance in a quintet configuration. The quintet opened the first half with two songs from the SNES game Earthbound (AKA "MOTHER 1+2"): "Sound Stone" and "Threed". This particular arrangement of the "Sound Stone" melody was quite lively, complete with stride piano. It featured solos by Shane, Johnny and and Sheldon. In contrast, "Threed" was a laid back bossa nova. One of the neat moments in this arrangement was the transition between the flugelhorn and tenor sax solos. There was a lovely dialogue between the two instruments, which weaved and bobbed like someone floating aimlessly in the pool or ocean. I could have sworn I heard a "quote" from "Rainy Days and Mondays" by The Carpenters for a fraction of a second. Next game on the set list was SimCity 3000, which is known for its jazz and new age soundtrack. "Updown Town" was a toe-tapping medium upswing. The trumpet solo began in the lower registered with shots that gradually led the listeners higher and higher. This was followed by an extremely chromatic piano solo, complete with rapid-fire blues riffs and shakes. After a very catchy vamp, the tenor sax solo gradually built up higher and higher, like a skyscraper. "Into the Darkness" from Final Fantasy IV was a lazy jazz waltz. The ensemble played upon the rhythmic ostinato from the introduction, working it into their solos. The flugelhorn solo was soft and mournful. In contrast, the tenor sax rose and fell like waves. The piano solo had punchy riffs and crunchy chords, while the bass solo played upon the theme, leading the audience deeper and deeper, lower and lower into blackness. Another highlight from the first set was "Love Song" from BioWare's Dragon Age. This slow jazz waltz featured a beautiful duet between the flugelhorn and tenor sax. The sax solo began simply, who lush long tones, but the rhythm grew in complexity, building the tension. In contrast, the piano solo featured tender chords that rose and fell like a sigh. It too gradually grew in intensity with crunchier harmonies. The gradual deconstruction of the theme was a neat effect, just before leading the audience back to the head. Three more video game themes were performed in the first set. "Buy Something Will Ya" (Earthbound) was a moderate swing number. "Zelda's Lullaby" (Zelda), which showcased the flugelhorn and piano. The Runaway Five closed the first set with the "Overworld Theme" from Super Mario Bros 2. The Runaway Five did their best to make the audience forget the miserable weather outside with "Koopa Troopa Beach" from Super Mario Kart 64. Was I the only one pretending to drive my Mario Kart around the beach during the performance? I hope not. The tenor sax solo was wavy, with splashes up into the higher register. The flugelhorn solo kept the mood high and bright, not just with playing in the higher register, but with the introduction of a different rhythm. The piano took that rhythm and changed it even more. When the head returned to lead us back to the finish line, it was a nostalgic moment. Another highlight from the second half of the show was "Muscle Soul" from Battlefield Bad Company 2 Vietnam (Hill 137). This isn't a game I'd normally play, so hearing this theme was my introduction to the music of Anders Lewen. This number opened with the bass and drums vamping on that opening riff until one by one, the rest of the company stepped in. The trumpet solo traversed a wide range, like a unit marching to their next mission. The sax solo was as soulful as the original recording. The piano solo had a little Motown, a little funk and a hint of disco. The Runaway Five closed the show with "Air Platform - The Athletic Rag" from Super Mario World. The quintet had fun playing around with the two main themes from this classic video game. The trumpet solo used the A theme as a springboard to new riffs. The tenor sax took the last rhythms played by the trumpet and then improvised on the B theme, then back to the A theme before tossing it to the piano, where we heard a chromatic treatment of the B theme, complete with zippy runs. The drum solo was playful, exploring different rhythmic and timbre combinations. Three more VG themes were featured in the second set, including the "Figaro Castle Theme" from Final Fantasy III (VI), "Green Hill Zone" from Sonic the Hedgehog 2 opened with the drums and music from Street Fighter. Founded by Brendan McElroy, the Runaway Five performs jazz music arrangements of classic video games, including Super Mario Bros., Final Fantasy and Zelda. In 2008 and 2009, the group performed at Massey Hall in Toronto during the Video Games Live tour. The ensemble members change, increasing or decreasing depending upon the needs of the show. The Runaway Five performed an intimate concert open to all ages on Saturday, April 6, 2013 at the National Music Centre. The interplay between the musicians was a delight to hear, while the themes left the audience feeling nostalgic about games past and present. If you missed the show, you can check out some of group's earlier performances on their Youtube Channel. The Runaway Five will perform later this year. Details to follow.